Saturn is easy to find because it is the brightest star or planet high in the southern sky. Here it is depicted around 9:30 p.m. local time on May 10 from Phoenix, Arizona. The view varies slightly by location. Just look high in the sky toward the south anytime in the evening from dusk onward. If you yet haven't done so, now is the time to get a look at Saturn and its rings through a telescope. In August, the rings will disappear for a while. 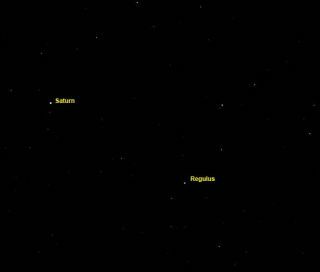 Fading slightly from magnitude 0.7 to 0.9, Saturn still outshines Regulus. (On this scale, larger numbers represent dimmer objects.) Compare Saturn's steady yellow light to the twinkling blue-white light of Regulus. Even now, the rings of Saturn appear no more than as a "bright bar" which bisects the planet's disk, a far cry from the big loops they presented back in April 7, 2003 when the rings were tilted 27 degrees. However, Saturn remains the telescopic showpiece of our evening sky. In small telescopes, they sometimes surprise even veteran observers with their chilling beauty even though it's expected. Any telescope magnifying more than 30-power will show them. From May 11 through 17, the ring system will appear at its maximum tilt in the evening sky during 2009: 4.15-degrees from edgewise with its south face visible. As the weeks pass, the bright bar will appear to get progressively thinner as the rings close to our line of sight. Finally, on Aug 10, the rings will seem to vanish. Why? The sun will no longer be shining on the south side of the rings; it will be shining on the north side. With nothing to illuminate them, the south side of the rings – that's the side that will be ever so slightly tilted toward Earth – will be all but impossible to observe, except perhaps in the very largest of telescopes. On Sep. 4, the rings will turn edge-on to the Earth. Saturn will transition from the evening to the morning sky a couple of weeks later. By mid-October you'll have to get up just before sunrise to view it, low in the eastern morning sky. By then, the rings will again be back in view as a thin line of light. The rings open to as much as 4.9-degrees by the end of this year, but in the early morning sky. What we are seeing with Saturn now is likely what Galileo Galilei was seeing when he viewed Saturn with his crude telescope back in the year 1612. In that year, Saturn's rings were also nearly edgewise, as they are now. What Galileo saw through his crude telescope left him completely baffled, as Saturn appeared to him not to have rings but rather two smaller bodies flanking it on either side. He couldn't make them out clearly and thought that Saturn was a triple body: two small orbs on either side of a large one. Later, when the rings turned edgewise to Earth and the two companions disappeared, Galileo invoked an ancient myth when he wrote, “Has Saturn swallowed his children?” Galileo lamented that his mind was too weak to comprehend this strange phenomenon. Actually, it was Galileo's telescope that was too weak; a better telescope would have revealed Saturn's companions as rings. It was not until a young Dutch mathematician, Christiaan Huygens (1629-1695) utilized a much better telescope and finally saw the rings for what they really were on the night of March 25, 1655. Huygens also glimpsed a tiny star, which after a few days of observation he deduced to be a satellite of Saturn (which today we call Titan). In order to stake his claim that he was the first to discover that Saturn was encircled by a ring, he published a mysterious code if he needed to provide proof later on. aaaaaaa ccccc d eeeee g h iiiiiii llll mm nnnnnnnnn oooo pp q rr ttttt uuuuu. "Annulo cingitur tenui, plano nusquam cohaerente, ad eclipticam inclinato." "It (Saturn) is girdled by a thin flat ring, nowhere touching, inclined to the ecliptic." If he wrote the Latin sentence intelligibly, all the letters would be used with none left over. In honor of his discovery of Saturn's rings and of Titan, In 1997 NASA and the European Space Agency (ESA) launched the Cassini–Huygens robotic spacecraft mission which currently is studying the planet Saturn and its moons. The NASA Cassini orbiter, is named for the Italian-French astronomer Giovanni Domenico Cassini, and the ESA Huygens probe, was named for Christiaan Huygens. On Dec. 25, 2004 the Huygens probe separated from the orbiter, and it reached Saturn's moon Titan on Jan. 14, 2005 where it made an atmospheric descent to the surface and relayed scientific information. Recently, Cassini beamed back another batch of brilliiant images of Saturn's rings, giving us a view from there that we can't get from here.